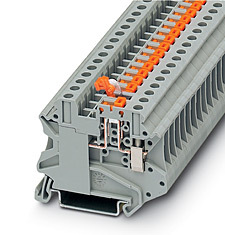 The XB Series includes application specific terminal blocks like the XBUT4TG disconnect block which accommodates disconnect component and fuse terminal blocks. It can also be bridged with standard terminal blocks via the double bridge shaft. The component plug XBPCO serves to accommodate different components such as resistors or capacitors. 5 x 20 mm fuses can be inserted into the fuse plug XBPFU, also available with light indication. The XBUT4MT knife disconnect terminal block features a compact design and a high current carrying capacity of 16A. Versions with test socket screws provide a test option for 2.3 mm diameter test plugs on both sides of the disconnect point.